Vice President Mike Pence made a brief stop in Colorado to speak at a luncheon hosted by a conservative super PAC. The vice president landed at Buckley Air Force Base in Aurora just after 11 a.m., greeting and taking pictures with a few dozen service members who gathered for the arrival. Take a step back for a moment and think about this. We are less than three weeks from the 2018 midterms, and ballots went out to Colorado voters at the beginning of this week. Republicans are facing defeat in the governor’s race, two incumbent GOP members of Congress are in danger of losing their seats, the normally-safe statewide constitutional offices of Treasurer, Attorney General, and Secretary of State are all up for grabs, and Republicans are all but certain to lose control of the one chamber of the Colorado General Assembly in which they currently hold a one-seat majority. 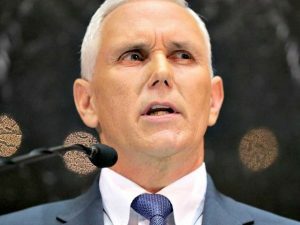 Into this environment arrived Vice President Mike Pence yesterday, and not a single Republican was waiting for him on the tarmac at Buckley Air Force Base. Not even one. We know there are anecdotal examples of Colorado Democrats choosing not to campaign with a sitting Democratic President, like Mark Udall controversially did in 2014–in hindsight one of a number of mistakes made by that losing campaign. But even then, Barack Obama was warmly greeted on his arrival by lots of other Democrats. Not so for Pence, who offered a canned excuse about Walker Stapleton’s schedule when asked why nobody wanted to be seen with him as he deplaned from Air Force Two. The real reason why Pence held no events for Colorado candidates, of course, is obvious: he would only drag them down. But no Republican can admit to that, so they have to play this game where they see how silly the excuses can get. It would have been better to fly the donors at Pence’s PAC fundraiser in Denver to DC, or just have them mail their checks. Because all Pence proved again yesterday is how damaged the Republican brand under President Donald Trump really is in Colorado. Pence put his eyeballs in for the trip though, so that's good. I wonder if any of the politicians showed up for the luncheon. Stapleton and Watson probably could afford it and might like hanging out with the conservative rich. Maybe in a big hat and dark glasses sneaking in the back door to spend some quality time with Pence and the donors.